Search engine optimization or SEO marketing services should be started in a long term perspective. SEO is entirely different from other online marketing methods. But the resources used for other internet marketing can be effectively utilized for developing SEO marketing strategies. The SEO marketing involves continues process including advancing the values and upgradation of website and its pages with potential contributions in quantity of content and quality of reputations. The quality reputations in the sense valuable social mentions and high quality back links from powerful websites and its pages. If an expert team can be identified, authorized to conduct, implement SEO marketing services for a business website, the yields achieved in sense of potential and quality customers and improvements of websites in sense of page rank, reputation, authority etc can be very high. Possibility of brand building and popularization are another plus points or useful byproducts of conducting search engine optimization in a business website. 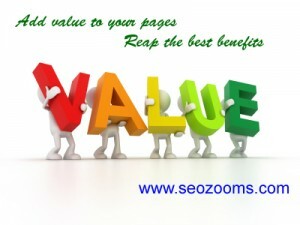 It includes optimizing website pages initially as easily crawlable and listing in search results of potential keywords. SEO process and practices have changed a lot during last two years. Number of quality updations, algorithm changes against spam activities like spam link building, paid links, low quality content, law quality reputations, manual link building etc. The punishments and fines caused due to not allowed SEO optimization activities made the seo marketing industry a competitive one. Regular work connection with competition does not mean regular publishing of less quality content. But publishing good stuff after a research on what type of information people are looking for or what kind of queries the users used to search when they are in search of service provider or product sellers. Call 0091 – 9020807078 and Contact SEO zooms for developing an effective SEO marketing strategy for your website and for conducting white hat seo marketing services. We have a professional SEO service team for optimizing your website and listing it in Google for potential business keywords.